The following is by Josh Glue, a Workers Party member in Hamilton, and was first published in the July issue of The Spark. It is adapted from a presentation given by Josh for the pannel discussion – the international situation– at the national conference of the Workers Party, Workers Power 2011, held over Queens Birthday weekend. Since the beginning of 2011, protests, uprisings and revolt have rocked the Middle East, from Tunisia to Egypt, from Algeria to Libya, Syria to Bahrain. Working people, as well as students, activists and professionals, have risen to demand democracy, often challenging decades of dictatorial rule from corrupt governments backed by Western imperialism and funded by oil wealth. Protesting against crippling unemployment, systemic government corruption, rising food prices, and brutal repression, the people have spoken out for control over their lives, in many cases facing harsh state violence for standing up for their rights. In Tunisia, the first wave of protests began in December following the death by self-immolation of an out-of-work young university graduate, who set himself on fire outside the government buildings to protest government corruption and constant police harassment. Protests calling for reform were violently put down, with several people shot by police. These crimes only exacerbated tensions, with even larger rallies calling first for justice for the deaths, then for the resignation of the country’s long-time dictator Ben Ali. With Ben Ali gone, his ruling party continued to hold power in a caretaker government, holding most key positions, but further protests forced a reshuffle and the eventual dismantling of Ben Ali’s party in March. In Egypt, massive popular demonstrations forced the Mubarak government to resign, placing state power in the hands of an interim military government. Many feared the new regime would act as the last had, using the State Security Apparatus to crush dissent, often using torture to keep the people afraid of opposing the status quo. In an act of bravery and conscious people’s power, a huge protest formed outside the local headquarters of the state security force in Alexandria. The people gathered demanded freedom from repression, investigation of the secret polices crimes, and justice for all those tortured in their dark dungeons. The secret police tried to shred all documents that might incriminate them, but the protesters stormed the building and seized documents and detained so-called police, opening up a real chance for justice for the people of Egypt. In Syria huge protests have been repeatedly crushed, with hundreds killed by soldiers so far. In one Syrian city, Dara’a, food has been confiscated and electricity shut off as collective punishment and to weaken the people’s power to fight. Chances for change there may depend on the willingness of the masses to make the struggle physical, to actively destroy the state as it stands. The Syrians may also need help from their neighbours in the struggle to win their own freedoms, as some reports suggest Lebanon is supporting protested materially. It remains to be seen what will happen there, but the tension there is unlikely to simply dissipate. Amid massive deficit, unemployment and poverty, the Jordanian government faced a series of protests that began in January with thousands of activists from the Jordanian Muslim Brotherhood, trade unions, and communist organizations calling for the Prime Minister’s resignation and that something be done about the social problems in the country. Thousand-strong protests continue regularly, and clashes with police and government supporters are common. What will happen in Jordan is also unclear, but the potential for change is there, all it needs is the will of the people. In Libya a rebel army of armed civilians and defecting soldiers has presented the first challenge to military dictator General Gaddafi in decades. What started as another wave of peoples protests there escalated into civil war after Gaddafi showed his contempt for popular democracy with a vicious military crackdown on dissenters. The involvement of Western military in the situation may help the rebels in the short-term, but it remains to be seen what the motivations behind such assistance is, and, if the rebels win any concrete victory in Libya, whether the West will leave them to find their own path to democracy or interfere and dictate terms as they have in other conflicts. In Yemen, massive protests have also occurred, starting first with anger over rising unemployment and inflation, and turning later to calls for the resignation of the country’s President. From January onwards, anti-government protests 10, 15, 20-thousand strong have been held in the Capital Sana’a and other cities. The protests even have inventive names like the Day of Rage and the Friday of No Return! The government response, however, has been severe. In March a protest in Sana’a met with violent police attacks and dozens were killed. The President enter mediation with the opposition, agreeing to step contingent on amnesty and an end to the protests, but backed out at the last minute, leaving the current political situation in question. In the capital city of Bahrain, Manama, protesters occupied the iconic Pearl Roundabout to demand greater political freedom. The Arab Spring has taken a different racial/class character there, as the protesters called for greater freedom and representation for the Shia majority, who are blocked from political agency and full rights by the ruling class Sunni minority and the power of King Isa bin Salman Al Khalifa. In March, in an attempt to suppress the protests, the king’s government called in soldiers from neighbouring Saudi Arabia to crush dissent. The uprising met with brutal punishment, many being beaten, and a few killed by state police or Saudi forces. Shia mosques have been demolished and hundreds arrested. While the crackdown has militarised the protesters somewhat, increasing calls for a republic or a real constitutional monarchy, most protesters remain moderate on the monarchy question, calling for greater parliamentary power, justice for human rights abuses, and an end to the demographic gerrymandering technique of importing and naturalising Sunni immigrants en masse to give the Sunnis greater control. When viewing uprisings like these from a distance, they seem to come out of nowhere. One day Egypt is a stable country, a friendly regional partner the west can rely on, even giving silent acceptance to the terror state of Israel, and the next day there are hundreds of thousands of people on the streets screaming for freedom, justice and democracy. In reality these movements develop over years. Progressive and anti-government organisations build during quiet periods, so that when there’s an up swell in activity, they are there to provide experience and leadership. The Muslim Brotherhood, an organisation with varying political influences that started in the 1970s Pan-Arab Nationalist movement, has followed this model of activity and played a major role in the Egypt uprising. We on the left in New Zealand can learn from these victories. We don’t face harsh repression for our political actions, conviction for our convictions. With the freedoms we enjoy because of the struggles of the past, we can organise now, in a period of low political activity, to be present and ready when conditions change, when the mass of people are ready to fight this country’s military imperialism in Afghanistan and economic imperialism in the pacific islands, as well as the exploitation of New Zealand’s own working class. Unions have also worked to build a presence in Egypt, particularly in the important textile industry and the highly valuable national asset the Suez Canal. 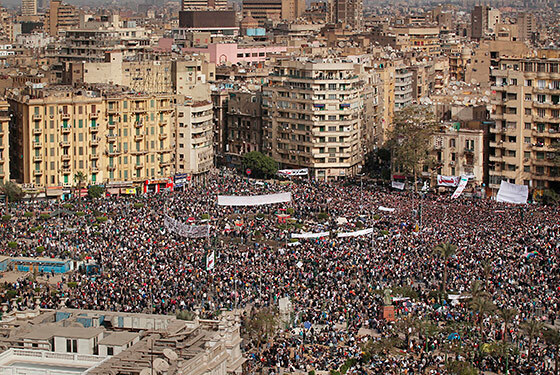 A key group involved in planning and organising the massive protests in Tahrir Square in Cairo and other cities was named the April 6 Movement in honour of the 2008 general strike started by textile workers in Mahalla and supported by activists, unionists and workers across Cairo. The strike itself was repressed with rubber bullets, tear gas and live ammunition, but the spirit of defiance it awakened in the Egyptian people smouldered away until the latest uprising, when it ignited in a fire of people’s power. Nearly 2 thousand strikes took place in Egypt since 2007, in defiance of the Egyptian Trade Union Federation’s pro-government calls for order. Working class consciousness is rising in Egypt, with strike activity being seen from public and private sector workers, from tax collectors to textile workers, from building to transport to food processing workers. Since the January 25th revolution began, the Egyptian working masses have celebrated May Day, the international workers day, publicly for the first time since 1952. New independent labour unions have formed, as well as an United Front grouping of 5 socialist parties, the Coalition of Socialist Forces, drawing together the experience and energy of worker activists, committed socialists and social justice fighters. Many within this group are calling for nationalisation of industries, an end to Neoliberal adjustment programmes and greater freedom for working people to organise, assemble and resist. The tide of popular unrest moving through the Middle East has huge flow-on effects for the geopolitical situation there and for United States dominance in the region. Some Western analysts are bemoaning the situation and wringing their hands at the possibility that Iran may come to dominate the new governments of the Middle East, particularly Jordan and Syria. This is actually a real possibility, as is the chance that the societies currently in the process of changing may take a more conservative stance than many on the Western left would prefer. Islamist forces in Egypt, Syria and elsewhere, hold onto Pan-Arab anti-imperialism but often hold out-dated notions of theocracy and religious intolerance, or reduce the fight against Zionist imperialist to a race-war against Judaism. As the people rise up in the Middle East, the close ties between the Imperialist nations of the West and the unstable dictators of the Middle East are becoming more visible to the people of those countries and the rest of the world. Connections between France and Tunisia’s ousted President Ben Ali have forced the resignation of the French Foreign Minister. France, Britain and the USA have been quick to back the new movements in the Middle East with words and in the case of Libya, bombings, hoping to maintain some influence on any new governments that might arise there, and avoid the embarrassment of public exposure for decades of backing inhumane and authoritarian regimes across the region . There is fear of Iran in these moves too, because if a new Syria or Bahrain, for example, took an anti-imperialist stance, seeing the support of America behind their former dictators, they might look to a regional power for direction, namely Iran. There is an unanswered question as to what role a new Egypt (and indeed how different Egypt will actually be) will take as a regional player in the future development of the Middle Eastern and North Africa states. It may seem obvious to many people in this room, but in order for the people of Egypt, Syria, Bahrain and other countries heaving off the shackles of corrupt and brutal government to be free and prosperous in the long term, they will need to fight for socialist republics. We in the West have no right to dictate how to create a revolution to people actually engaging in a real revolution, but in order to truly overcome the inequality, unemployment, mistreatment of minorities, oppression of women and poverty these countries have inherited, their people will need to look outside the limits imposed by capitalism and the bourgeois parliamentary process. That path is one of people’s power, of popular ownership and democratic control of resources and industries, of liberation of people from all forms of oppression and exploitation. That is the path of revolutionary socialism, and hopefully the path the Middle East, and indeed the world, will one day follow. The question is whether that day is dawning now, in Cairo. The escalating mood of revolution and reform in the Middle East, particularly Egypt, also impacts the situation in Israel. Egypt has long accepted the existence of the state of Israel, despite the historic robbery of the Palestinian homeland and the savagery of their treatment at the hands of the Zionist state. The Egyptians themselves have also suffered directly at the hands of Israel. The last Egyptian leader to oppose Israel had his air force destroyed by an Israeli surprise attack. The Palestinians, despite having every right to view their situation as so much more dire than that of other Arab states, have demonstrated in solidarity with the people of Egypt and Syria and other states going through political transition. With Egypt starting on a new path, the potential for popular control of the democratic process there is huge, whatever the limits imposed on that process by bourgeois democracy. Egypt shares a border with the embattled Gaza strip and monitors the Rafah crossing. The decision of the Egyptian interim government to reopen this crossing on the 28th of May is significant, as it will allow people to enter and leave Gaza more easily, alleviate the humanitarian crisis Israel has created in Gaza and potentially allow a greater flow of material support for the Palestinian resistance there. Unfortunately, Israel will still control cargo movement through the Rafah Crossing, but the Egyptian move does show a greater solidarity between their peoples and their Arab neighbours, less fear of Israeli military force, and recognition of the elected Hamas government in Gaza. The Israeli government has long recognised one of the biggest challenges to the illegal occupation of Palestine is opposition from neighbouring Arab states, even precipitating war to quell such opposition early in the Zionist state’s history. If the nations of Syria, Lebanon, Egypt and Jordan move in a more democratic and revolutionary direction as a result of these uprisings, a Pan-Arab defiance of Israel, and support for the Palestinian resistance, might arise, helping to turn the tables on one of the greatest humanitarian crimes of the 20th and 21st Centuries, the Zionist State of Israel. What the Arab states need is Socialism not democracy. The only change democracy will bring is the right to have an election paper. There will still be corrupt politicians and unemployment, high food prices, low wage, poverty and same old economic system. Socialism will help them because it will get rid of unemployment because govt will manage their workers more effectively. Socialism will introduce an increased minimum wage, workers self management and the elimination of the rich. Therefore it is better for the people. But the Arabs do not realize that yet. Breaking away from the current narrow conception of democracy. What’s wrong with Socialist democracy? Does that not exist?